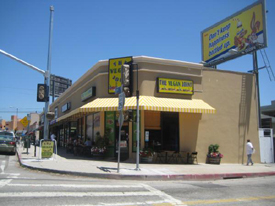 The Vegan Joint in Los Angeles is a tasty way to eat healthy. They serve breakfast all day, which is totally awesome, seeing as I love breakfast at night. I went in at 9:30 pm and snagged some wheat-free pancakes and hash browns with cheese. My buddy got a Tofu Scramble Burger that I couldn’t help but pick off of as well. Wow! So fresh and tasty, it was an absolutely different experience from most LA food (where In & Out is king). I didn’t feel heavy or tired after I ate (even though I ate way too much) and I actually got a bit of an energy surge about half an hour later. It was a nice second wind. I plan to go back soon, as the food wasn’t only tasty and healthy, but relatively cheap. It was absolutely worth every penny! I will be the first one to admit that I am always a little weary of going into what my mother calls "hippie cafes" but I now have no reason to fear them, at least not at Bloom! The food here is spectacular, and the service was even better! No one was looking at me in my suit and tie like they were going to lecture me on the evils of the corporate world (I work in a bank, and look the part). No one even gave me a second glance, as happens sometimes in the smaller, hipster haunts. Everyone was too busy eating, and that is exactly as it should have been! The food! Oh my gosh the food! I had the free-range chicken and apple salad, and it was superb! Knowing that it was all raised organically was just the all-natural icing on the pesticide free cake. The atmosphere is relaxed, the prices are very reasonable (my entire meal was less than ten dollars) and the staff was knowledgeable without being pretentious, something that I rarely seem to find in organic cafes. To give this place five stars would be an understatement! Looking to make the USDA grade in the next year or two is Le Pain Quotidien, a chain of organic restaurants and bakeries in Europe, New York and Los Angeles where more than 50 percent of the raw product used is organic. The company's founder, Alain Coumont, is planning on certifying his bread first, since the company already uses organic stone-ground flour. In addition, the cafes use organic vegetables, teas, juices, eggs and milk. The Belgian-born Coumont, who apprenticed with superstar chefs such as Alain Senderens and Joel Robuchon, has a passion for all things fresh and chemical-free. He even owns an organic farm, complete with olive orchard and vineyard, in the Languedoc region of France. "Food that has been grown in organically nourished soil is packed with nutrients and bursts with flavor," he declares. More people are joining what Coumont calls the "organic revolution." Sales of organic goods have increased by 20 percent to 25 percent a year, the only part of the food market that is growing in the double digits, according to the Organic Trade Association in Greenfield, Mass. 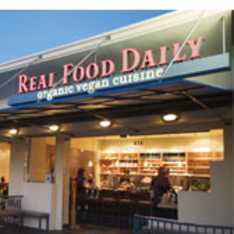 While vegan and organic restaurants such as Real Food Daily in Los Angeles and Angelica Kitchen in New York City have long incorporated organic foods into their recipes, many traditional restaurants are now filling their menus with hormone-free meats, hook-and-line-caught fish, hydroponic vegetables and fair-trade coffee. There is a indeed a new trend in eating healthy, with organic restaurants leading the way! The Urth Café’ in Hollywood, California is a big hit with all the locals and people even come from out of town to visit this little café. It is usually packed every day of the week, and especially on weekends. Don’t be surprised if you see a celebrity or two being followed by the paparazzi leaving Urth Café, not only is it a healthy and organic restaurant, but a really popular hot spot with celebrities. Although it is a small café, the only way they’re able to seat so many people is because they have inside, patio and outside seating. Parking is limited, so you’re better off with a valet, which is right in front of the café. 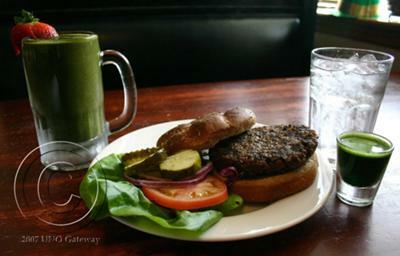 The items on the menu vary from salads and soups to sandwiches and a wide variety of coffees. Their combo meals are great and come with a lot of food. One would be well advised to grab a menu and seriously look at what they have to offer before getting in line. The line goes really quick! I really enjoyed the tuna salad (big portion) that was really fresh, along with the black bean soup. It comes with bread. My friend was really into the mocha latte, which looked really cute (heart in the center) and was really big. I (Natalie) tried it, and it and I thought it was just okay but a big hit with other people. 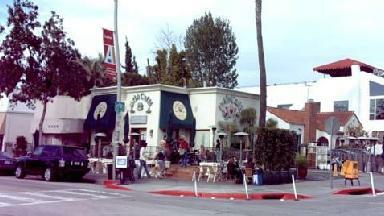 All in all I would have to say that Urth Café’ is not to be missed if you are ever in Hollywood. If you are on the west side of Los Angeles and are looking for an amazing restaurant that takes advantage of the local organic and slow food scene, consider Akasha in Culver City. This upscale restaurant opened in 2008 and has quickly shot to the top of a lot of Angelenos' lists of favorite restaurants. I went here recently with the goal of trying grass fed beef. I am a meat eater, but I also like to keep it healthy and eat only whole, non-processed foods. Akasha is perfect for people like me. Though it has a lot of vegetarian options, it is focused more on sustainability, organic certification, and slow food rather than a vegan perspective. If you have never tried grass fed beef, you need to and you need to try it here. It tastes so much different and better than the corn fed beef that most restaurants serve. It has a deeper, more gamey taste, and a much lower fat content since the cows the meat comes from are allowed to graze. All the sides that came with the steak were organic - I had a mushroom polenta and a mixed greens salad. The desserts and drinks are organic and whole food based as well. 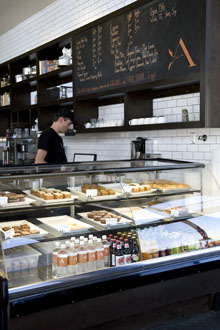 I wholeheartedly recommend Akasha to anyone looking for an upscale organic option in Los Angeles. In celebration of a friend's birthday party, I went out to dinner at Real Food Daily in Los Angeles, California. Because my friend was vegan and didn't eat any dairy products, Real Food Daily was an excellent choice. I was a bit skeptical about the restaurant at first (the idea of eating tasteless, dairy-deprived food seemed to be a bit of a turn-off), but the meal turned out to be absolutely delicious. The meal was so delicious that I would have not even guessed that all the food there was vegan and organic. I ordered their chicken seitan TV-dinner, which reminded me of the microwave dinners I used to get as a kid only fully flavored and totally organic! I enjoyed this meal so much that I would go back to Real Food Daily in a heartbeat! A few weeks back while on Christmas vacation in Los Angeles, I ran upon this new organic restaurant in the "Marina del Ray" area. On Sunday December 28 I felt like enjoying a nice Sunday dinner in the Marina. So, an old girlfriend and I met up there and ran upon this new spot--"The Organic Panificio". The name lead us to believe it was some type of health food restaurant...boy were we surprised! Once inside, we were blown away with the decor--a mixture of up-town (classy) and the beach (sports bar). We elected to sit on the patio but soon moved inside to catch a view of the football games on one of the many TVs. A view of their menu reviled a bunch of great organic selections. There is something there for everyone, even kids. We both loved our selections. I opted for the fries over the green soup. Crazy me! While dining, a nice and funny guy, walking with the aid of a golf club, came to our table to greet us. During our conversation, we found out that he was the owner. I told him I was visiting from Atlanta and was a CPA with restaurant clients back home. We talked about his vision for the restaurant, the economy, food and he even offered me the use of his laptop, because I was bidding on an "Ebay" item. I thought that was real nice of him. It looked as though his wife was working there too. I like that family touch when it comes to eating spots. Maybe it's that southern, down-home style. In conclusion, I'd like to say that I really hope this spot make it because once fully up and running it will offer a variety of great entertaining and dining options. I'll come back to this great organic restaurant on my next trip to Los Angeles.